We’d love your help. 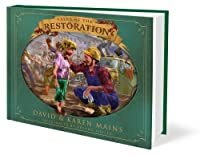 Let us know what’s wrong with this preview of Tales of the Restoration by David R. Mains. The residents of Bright City continue the struggle to subdue evil and to work for the complete restoration of the king and his bride to rule over them. To ask other readers questions about Tales of the Restoration, please sign up. Loved this one too, as the King and his people work at the restoration of the city, which was once Enchanted City, but is now freed from the Enchanter and now called Bright City. Hero and the others are grown now, and are joyfully working in the Restoration. In the midst of it, love blooms, and I always love the angst of love stories, so this was a nice ending to this trilogy. To the King! 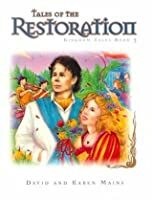 To the Restoration! This collection is like a reunion of the characters from the other Kingdom books, many whom have lost their purpose and need reminded of it. I actually liked this one better than the first... again a childhood favorite. 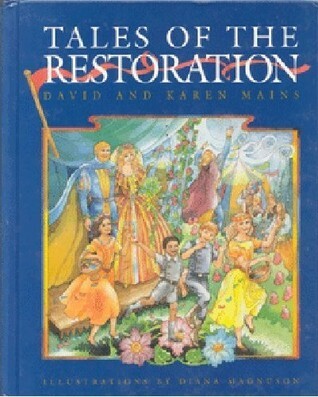 This is not my favorite book in the series, Tales of the Kingdom is, but I really Tales of the Restoration. It is a good ending book for the series. Not as good as first two but still quite good. Not quite as good as the first - tales of the Kingdom & the 2nd - Tales of the Resistance. Still an excellent book. They are all better in the hardback editions or on audio! The edition I really want is out of print and would probably cost me a bundle, but I would love to own the trilogy and pass it down to my kids. Reading this three book series to my kids. We all love it. Lots of heart in this story. Love this series. Very imaginative. Positive messages. Twelve more stories in the last book of the trilogy. This one did not end each tale with a written moral to contemplate. The hidden truth was implied in the reading. Time has passed since we met the major characters. Much growth and wisdom. A new found purpose - destiny or place in the Kingdom. Restoration, to me, in biblical terms means to go back to the original plan/purpose, especially after getting off course or adversity interference. Did all end like this in these tales? To me NO! The tales Twelve more stories in the last book of the trilogy. This one did not end each tale with a written moral to contemplate. The hidden truth was implied in the reading. Restoration, to me, in biblical terms means to go back to the original plan/purpose, especially after getting off course or adversity interference. Did all end like this in these tales? To me NO! The tales end with a celebration and I'm left confused and wanting more answers. Why so many loose ends? Where's Sovereign? What happened to the Enchanter and his crew? Where are the punishments? Where's the Rewards? I don't see a logical conclusion. Why name Restoration? To me this restoration wasn't complete. There's so much that still needs to be done. I'm happy for Hero, but isn't Restoration suppose to be for all in the Kingdom? Of the three parts in this trilogy, this is my least favorite. I'm left wanting more...no resolve...only unanswered questions. Why start the trilogy without a definite conclusion? Maybe it's the adult in me. I guess I need to look from a child's perspective. See this as fairy tales and maybe the ending for the main character is fine. As an allegory pushing a personal relationship with the King and Restoration of His people, I'm so disappointed!!! Ugh! I need more! I need this to be done better! I don't want an afterthought, but a full blown positive conclusion as representative of Restoration!! I shouldn't fret...at least I was able to read thirty-six reasonably done tales with a moral to boot. David R. Mains has been dedicating himself for spiritual growth development programs that disturb ordinary presumptions. During the year 1967 he built an experimental church in a Teamster’s Union Hall in West Chicago. Some church-planting specialists proclaimed that it can't be done but then with a few supporters, the church has grown from only 27 until 500 for ten years. Mains' system is advanced David R. Mains has been dedicating himself for spiritual growth development programs that disturb ordinary presumptions. During the year 1967 he built an experimental church in a Teamster’s Union Hall in West Chicago. Some church-planting specialists proclaimed that it can't be done but then with a few supporters, the church has grown from only 27 until 500 for ten years. Mains' system is advanced that he joined together worship with arts and media. He implement a system to service planning focusing one concept making the entire worship communication into just a single but valuable idea. Lay people were invited and brainstorm sermons and he firmly incorporated that each sermon should include practical ideas so it will be integrated with everyday living as Christians. During the year 1977, Mains replaced his uncle John D. Jess as Director of a national radio broadcast, The Chapel of the Air. He then started to use religious media that would boost spirituality on every listener. Mains transformed broadcasting as a service to the local church rather than competing them. He then began to train a team to do on-air voices which includes his wife, Karen Mains. Several experts again warned him that such a service can’t be done but then he was thrilled when the first Spiritual Adventure he implemented had reach 7,000 participants. Mains has been a Christian communicator and his passion was always for the local church to experience the living presence of Jesus Christ. A pastor once gave him a gratitude for putting his own personal agenda to serve for the good of the local church. Now, Mains resigned from the broadcast and created Mainstay Ministries which dedicated to help church leaders and its people by several growth tools and training seminars. He established Team Sundays where every church goer would experience a life changing Sunday. His goal in Mainstay Ministries was to help pastors be effective in preaching.